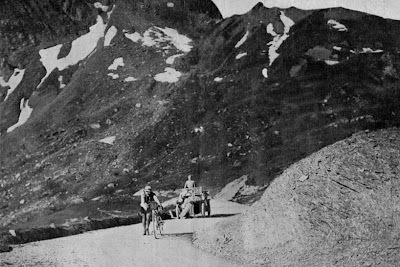 In 1910, the Tour de France crossed the Tourmalet in the Pyrenees for the first time (Octave Lapize is pushing his bike up the hill in the photo above) an event marked by this year's TdF course. For an idea of the importance of this climb in sporting terms, l'Equipe has produced a slide show, which you can watch here, with 33 photos of the pass, in different eras. Enjoy this warm-up for my reportage of the 2010 Lost Boys Tour of Europe. (I particularly enjoyed Slide #10, which appears to show a gremlin inflating a tire as the cyclist avoids eye contact).